Download Bank of India Exam Admit Card 2018 – Bank of India (BOI) released call letters for Officer (Credit) Online Examination. Candidates who have applied for the recruitment of Officer (Credit) in General Banking Stream can download their call letter for the examination. Bank of India has uploaded the exam call letters on their website. Candidates are requested to download their admit cards from BOI careers (website). BOI announced exam date for the online exam. As per the announcement, exam will be conducted on 10.06.2018. Before appear for the exam, candidates should ensure that they fulfil the eligibility conditions given in the BOI advertisement. At the time of examination, carry call letter and photo identity proof in original and also a photo copy. Admit is like a gate pass for an examination. Without admit card, candidates will not be allowed to attend the examination. So don’t forget to carry the call letter and necessary proofs to examination hall. Call Letter may have information like candidate’s registration details, exam date, exam venue and important instructions to the candidates. Logon to Bank of India website and then locate Careers. In Careers, find notification for Officer (Credit) online exam call letter. Click the notification to find Call Letter and Information Handout links. Click the call letter download link and login with registration details. Find your call letter and then download to take a hard copy. 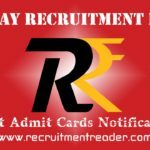 For more details regarding Bank of India Exam Admit Card 2018 logon to www.bankofindia.co.in. Find upcoming Bank of India job notifications @ Recruitment Reader.